Well we didn't miss the storm. It rained last night and then turned to snow sometime in the early morning hours. Right now I would guess it is about 4" and still snowing fairly hard. Supposed to start getting very windy this afternoon and then slack up about 6PM today and warm up a bit tomorrow. It would sure be nice if Spring wedged its foot in the door after this one. At least for a couple of weeks. 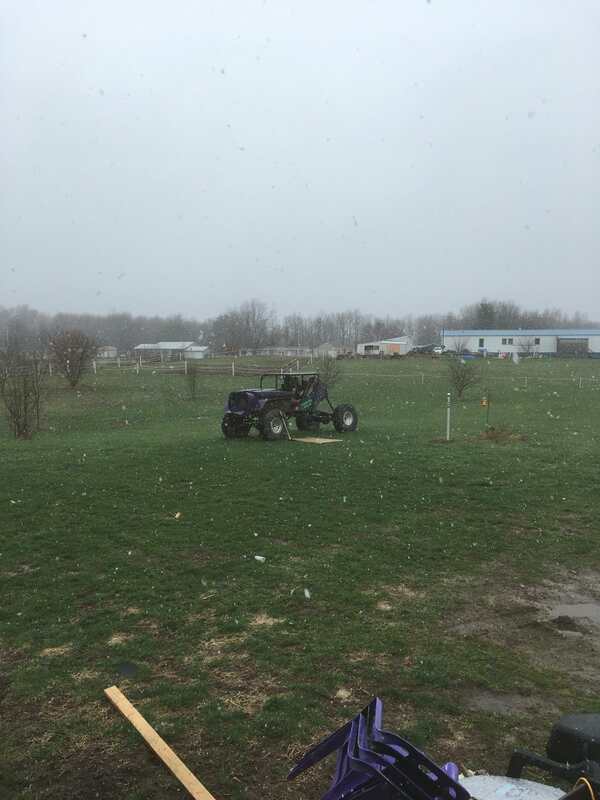 Tomorrow is Spring Turkey opener but I don't think it is worth going out with this storm even if it will be moving over to spend some time with Wolfy on Saturday and Sunday. We're finally getting a break. Highs around 50, still frosting at night. Maybe some snow on Tuesday. The up side is that the trees still think it's winter. Our pattern for the past few years has been an early break up when the trees start budding out or even blooming the end of March, then a killing frost the middle of April that destroys all the buds and no fruit sets. One year we got 25 bushels off our apple trees and the next year only got 5. We have only light rain and 25 mph winds here right now, but then the carp hits the fan around 2 AM. They still have us in a WINTER STORM WARNING classification..... . 45-50 mph winds and 8 inches or more of heavy, wet snow. The bigger farmers with lots of acres to plant are getting nervous. One of you fellas from the frozen tundra or heartland wanna come mow my grass? It needs it-----again. 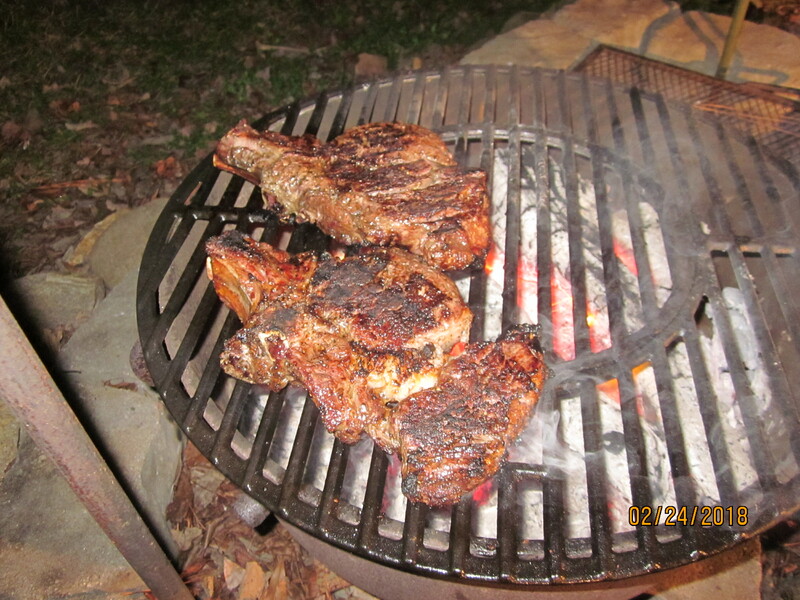 I'll throw a big ole bone in ribeye on the grill for ya. Only 81 F here today. I know you guys have seen this pic from back in February, but I just thought you might like to see it again. You're a funny guy, nuke. You knew I was a vegan, right? S'OK, wolfy. I'll throw some zucchini or brussel sprouts or something green on the grill for ya. North Eastern North Dakota is sunshine and 29*F. Wind gusting to 24 MPH makes it feel kinda cold. Made an appointment today to have my studded snow tires changed out on Monday. State law says we have to have them off by the 15th of April. I'll have to use the snowblower on the tractor to get into the storage buildings to retrieve the summer tires. Seems to be a little irony there. Daughter in South Eastern South Dakota is in a full blown blizzard. Winds gusting to 40 MPH and 5 inches of snow expected. It's not scheduled to let up until about dark tomorrow (7PM 14 April). Her livestock was sheltered and everyone is hunkered down for the duration. Its only a 30 hour blast so everyone there should be good. They're all indoors and no one needs to go to work. Son-in-law just got a new to him 3020 JD with a loader on it. I'm sure he's looking forward to trying it out on Sunday after this blows over. At least he'll find out what needs to be changed for next year. Song birds have started to cycle in. This is really tough on them. The owls are nesting and the hunting has got to be difficult for them with all the snow we still have in the fields. Everybody is more than ready for spring. well spring is just around the corner here in west central,mn. i saw it on the internet so it's gotta be true, right. Just leave them steaks on for me Nuke. I ain't no Vegan. We did have a bunch of Robins standing on the sidewalk I just shoveled off and looking like they would kick somebodies azz for arriving up North too early. Yesterday the Sandhill cranes came through in several big flights. One of those landed over on the river and stayed the night. Surely these are signs that we will have a short Spring soon. Drove the 75 miles from town to home this evening. Sandhill cranes in the fields that didn't have snow. Most of the snow farther north has cleared and we count 38 deer the last 40 miles. The deer are glad the snow and rain has stopped for a couple days, and with the new moon nearly here they were out feeding early. Sunny and cold this morning. Snow has stopped. We didn't have the high winds they said were coming and that was good. It is muddy and the fields are covered with snow. The roads melted off quickly and are mud bogs in places. My truck must weigh 1000 pounds more that usual with what is packed in the fender wells. I need to make a highway run and knock some of it off. I really hope we can have decent weather for a few days. If I lived in a place with gumbo mud, I'd probably own a pressure washer. We have gumbo here that is so thick and sticky you would wear out the pressure washer before you got it all off. We go to the car wash and let that guy clean up the mess. I think a good hammer-drill might be just the ticket for gumbo removal. I know y'all think it's April 17th, but I'm pretty sure it's the 97th of January. Hahahaahahahaha!!! Good one! I may have to use that if we get the snow we're promised in the morning. This is good news Nuke. My birthday won't roll around this year. Looks like we're headed for another freak spring storm in northern Iowa, they are calling for rain, sleet, freezing rain and anywhere from 3"-10" depending how close we are to the equator. Then it's suppose to warm back up to the 50's by the weekend. 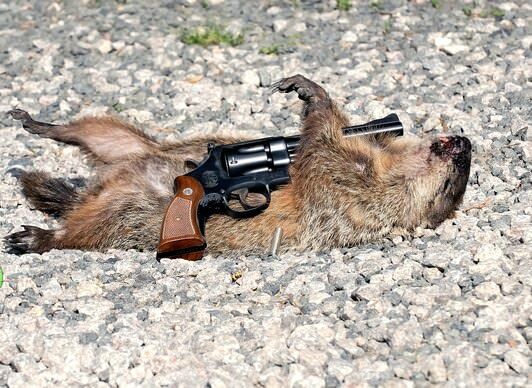 Punxsutawney Phil, the King of Groundhogs, was found dead from an apparent self inflicted gunshot wound after predicting an early spring. The little %$^& deserved it too! Good! Saved me the trouble of hunting him down and eating the SOB! Last night April 19th thru the 20th am was BAD. A lot of black ice and high winds. On one of the mountains on I-81 in PA at mile marker 130 something there were 3 wrecks. A car and a truck hauling a trailer in the median from the northbound side, and a big rig garbage hauler on the right shoulder of the southbound side. The pickup and trailer were upside down in the median and the garbage truck was wedged in the ditch against the giant rock wall along the road. 3 bad wrecks at the same exact location I believe means a wind gust pushed them over. They were all in a perfect alignment from east to west. I never would have thought the driving would be so bad in April. Coming home around 6 am between Whitney Point and Marathon it was thick ice on the road. 30 mph carefully!!!! They even salted the roads prior. !?! Well we survived, about 5" at my house, 12 hour work day getting people their packages. At about 5pm, the sun came out and started to melt some of the crap. 59F here today. But, they are calling for possible rain during the night. This guy died from a gunshot wound that I inflicted. .22lr HP at about 25 yards to the back of the head, such a destructive SOB. Yowza, hit 55 today. Snow is leaving us in a hurry. Checked on the shooting range today. It's surrounded on three sides by dirt and the snow is still 4 feet deep in there. Probably be at least three weeks before I can use it. But, 50oF what a great day it was today. It was windy here all darn day. Went out to see if there were any turkeys gobbling but this wind has them sitting tight somewhere. Probably could not hear them if they did. Sounded like a bunch of jets going through the trees where I was sitting. It rained for awhile too. Supposed to be a little better tomorrow. The Turkeys did show up but it was about five minutes after sunset and it was past legal time. Probably spooked them when I walked out too so it will be awhile before they come back to the roost area I was at. can't believe how warm it was today. The heck with Phill...Spring is just around the corner! We hit 80 deg on Friday. It will be a high of 50 on Monday. But we dodged the bullet on the rain and flooding. We were forecast for 3" of rain, and got 0.01". I heard a rumor that 3 weathermen ate their guns. Xj, my ex-son-in-law was from Syracuse. He got a tic in his left eye every time anyone even mentioned snow. We had a very nice afternoon here. 85 degrees in the sun, Turkey's gobbling down on the river, no wind, and a forecast for rain tonight and tomorrow. It is so green right now it looks like we went to Ireland. Everything is budding out now, except the apricot and plum. Hope we've seen the end of the frosts at night. 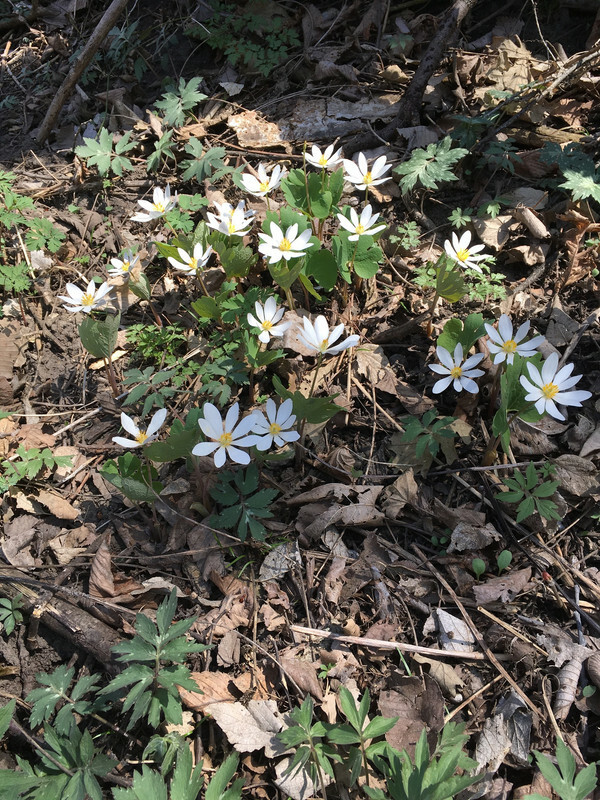 The wind was blowing at a steady 30mph here today, BUT it was sunny and it got up to 79*......pasque or Mayflowers, a sure sign of Spring, showed up for the first time today on a walk in the woods at Ponca State Park. Took the 4 wheeler out tonight. Most of the snow is gone, just a little left in the ditches, and that's OK. I'm tired of looking at it. Tomorrow is forecast into the 70's and that should just about finish it off. 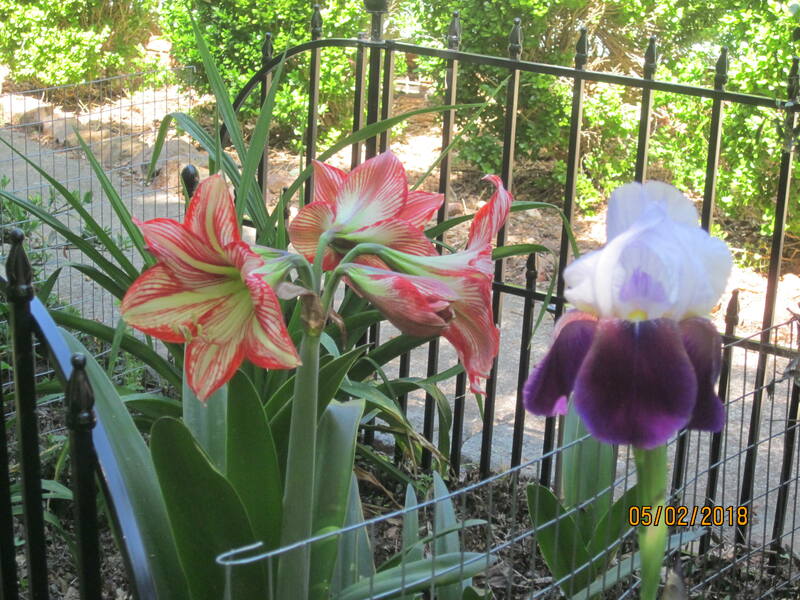 Iris and amaryllis. These help make up for the 14 diseased dogwoods I had to remove yesterday. We FINALLY have some daffodils blooming, but I love that amaryllis! What exactly happened to the dogwoods do you think? A fungus called anthracnose. Lots of plants/trees get it, but it's pretty devastating to flowering dogwood. There are treatments and things you can do to help alleviate it, but with over 60 dogwoods here on the property and every dogwood in the neighborhood having it, it's pretty futile to try to save them. Yeah, I'm all too familiar with anthracnose fungal infections.....corn & soybeans are susceptible to it, also. It's not as much of a problem as it used to be in those crops because of genetic modifications to the seed......just one of the 'pros' of GMOs. Usually, it's not too bad here. This time, however, a hunk of the 'polar vortex' has separated from the parent PV that covers the northern polar region. This storm brings little, if any, snow along with it, but it is gonna get danged cold! We have been hovering around zero (+ or -) for the last few days, but high winds have accompanied this rogue hunk of the PV.....night before last we had winds of up to 66 mph and minus-degrees actual air temperature. Today, tonight, and into Wednesday we are officially under a WIND CHILL WARNING......minus 22*F air temperature accompanied by winds capable of taking the wind chill down to 45-50* BELOW ZERO! PS: In just 2 days we will be basking in +45-50* temps.....that would be a nearly 100* temperature swing! We are at 8 F at the moment with a stiff wind out of the northwest. I would guess it is about 30 mph right now. Don't know what the wind chill is but the snot freezes in my nose walking over to the water tank by the barn. The cows are huddled up in the old sheep sheds down by the road and are out of the wind. Glad I ain't one but at least they have shelter and enough food to get through the day. So far (knock on wood) the power has stayed on so the tank heaters are working well. I always thought that people who go to Arizona for the winter were kind of wimpy. These days I am not quite so sure about that. Woo-Hoot! what a day. By 1:00 PM local time we had warmed all the way up to -26*F and the wind chill was at a minus 57*F. What a beautiful day. And tonight we get to visit -39*F. needed. I saw that it was brutal weather over in Minnesota, Iowa, and easter Nebraska. Hope all is okay till this moves out. Whew, that is cold. Chilly here too. Might have to put socks on with my flip flops. My wife yells at me because I'm in the habit of doing my 20 minute run to the chicken/rabbit/duck yard in the morning in +20F weather wearing my lounge pants, slippers and a T-shirt. After two winters in New Hampshire, 4 winters in Omaha, and 4 winters in Anchorage, and 19 years up here, NW Montana don't show me much. Wait.....is this a test, or are we supposed to vote? As most of you know I'm French Canadian by ancestry and parental experimentation, and I always liked Canada, didn't cotton much to their politics, but the way it's going Canada is now a bit further to the right than we are. Anywho, I'm a little miffed at Canada right now, it seems that they are pretty proud at being able to control just about everything that happens in their country, but they don't seem to care much about keeping their frukkin' cold on their side of the fence. *OP, if your wife doesn't like the way you dress when you go down to the Chicken/Rabbit/Duck yard in sub freezing temps, that's easily addressed, tell her to get dressed anyway she wants, and she can do it.